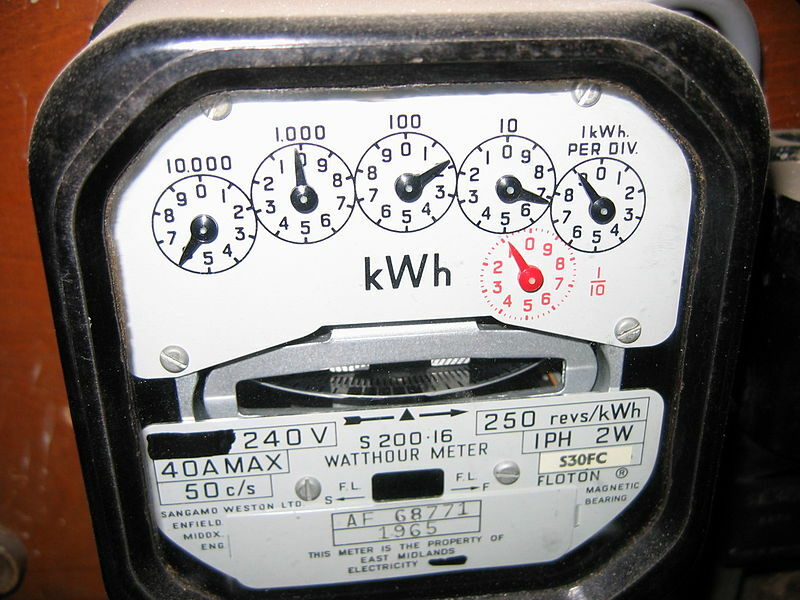 Image: a mechanical electricity meter. Picture in the public domain. Modern infrastructures for energy, water and communications are systems of collective provision, often organised and financed by the state. The appliances that are plugged into these infrastructures – such as laptops, washing machines or electric cars – are considered to be individual consumption goods, provided by the market. But exactly where do the edges of universal provision and individual consumption lie? In practice, what counts as appliance or as infrastructure is often open to debate. The fact that these interfaces are sites of controversy and contest is not an outcome of bad management. Rather, it reflects ongoing struggles to define and allocate the roles and responsibilities between state and market. How these struggles are resolved, is crucial for the evolution of energy demand. Where do Infrastructures Begin and End? Electric cars (EV’s) require the installation of a special home charging point, either a simple dedicated plug or a bigger “wall box”. Is this wall box to be viewed as part of the car, as a ‘terminal’ of the infrastructure, or as a separate consumer device in its own right? How and by whom should it be provided? When interviewed, French electric vehicle owners explicitly commented on where and how boundaries should be drawn – in other words, where the car begins and ends. Some thought the costs of the charging point should be incorporated in the cost of the electric vehicle – the car and the charger figuring as a single unit of individual consumption, similar to a mobile phone and its charger. Others thought that the costs should be covered by the state as part of a wider mobility infrastructure – the charger and the infrastructure figuring as a single unit of collective provision. Finally, still others viewed the charger as a separate consumer product, in which the charger, alone, figures as an item of individual consumption. Electric car makers are also answering these questions in different ways. Tesla Motors has extended the scope of electric car provision and offers a total package including the supply and installation of a dedicated wall box. Most other car makers leave the specification of the charging interface to specialist electrical companies or to third party providers. At the same time, some government bodies are using tax money to provide public charging points for electric vehicles. In Infrastructures in practice: the evolution of demand in networked societies, (forthcoming: Routledge) editors Elizabeth Shove and Frank Trentmann have collected contributions that explore how infrastructures and daily life are woven together. A major theme in the book is the negotiation of boundaries and interfaces. Infrastructures do not only distribute things like power, water or data. They also allocate and reproduce social roles and responsibilities, most obviously between provider and consumer, but also between planners, managers, repairers, financiers and operators. For example, exactly how the wall box and other components of the EV charging infrastructure (cord, plug, communication system) are designed, operated, paid for and maintained depends on their status either as part of a system of collective provision or individual consumption. If the wall box is considered as a separate consumer good, all costs fall to the buyer of the electric vehicle. The same is true if the wall box is viewed as part of the car, but with the further complication that these proprietary ‘turnkey’ solutions tie the householder to a particular brand of car. Finally, if the wall box is considered part of the public infrastructure, the costs are for all tax payers, including those who don’t drive (electric) cars. Boundaries between universal provision and individual consumption are constantly shifting in concert with technological innovations and social changes, causing periods of uneasy adjustment between infrastructures and those who organise, manage and use them. During these periods, the roles of consumer and provider are momentarily unsettled, uncertain and unclear. By looking at critical junctions and at interfaces between public and private goods, we can see the active production of boundaries that are commonly taken for granted. Debates at the interface reflect ongoing struggles to define and allocate the roles and responsibilities between provider and consumer and between state and market. The struggle over the wall box is still ongoing and will, to some degree, shape the future of electric vehicles. However, even when debates at the interface are settled, it’s rarely for long. In the case of electric cars, new challenges are already appearing on the horizon. For example, vehicle-to-grid is a technology which uses electric cars as batteries for renewable grid electricity. The idea is that an oversupply of wind or solar energy can be stored in the batteries of electric vehicles, which can then supply the grid with electricity in times of undersupply. Vehicle-to-grid technology will again reconfigure the relationships between individual consumption and collective provision, because somehow the batteries of the private cars need to be managed by the grid operator. One outcome could be that owners of electric vehicles would no longer be accountable for the battery that powers their car. Other arrangements are possible. Understanding how ‘interface controversies’ are provisionally resolved is crucial for understanding the longer term development of infrastructures and appliances and for the relative agency and influence of the different actors involved. The smart electric meter is another good example. Is the smart meter to be viewed as the ‘terminal’ of the infrastructure or as a consumer item in its own right? Electric meters have always been situated at the boundary between infrastructure and appliance, but the arrival of the smart electric meter in the late 2000s, in the context of the liberalisation of the energy sector, has destabilised this boundary. Intelligent metering systems are being rolled out on a massive scale in both Europe and the United States. One of the official justifications for the roll-out is that smart meters will enable households to monitor and better control their electricity consumption in real-time. Because electro-mechanical and electronic meters need to be read and controlled manually by an employee of the power company, consumers generally pay for estimated electricity consumption based on the latest read-out. Smart electricity meters, on the other hand, can provide the consumer with accurate details of their electricity consumption, the idea being that this will help them reduce it. On the other hand, smart meters offer a range of benefits to electricity providers and distributors. The devices enable automatic transmission of data not only to consumers but to utility companies as well. This allows them to do away with meter readers and to bill customers automatically, which saves costs and reduces complaints about bills based on estimates. Smart meters also help energy companies detect unauthorised consumption and electricity theft and make it much easier to cut off supply if bills are unpaid – there’s no need for a technician to visit because the meter can be remotely controlled by the company. Consequently, the smart electricity meter is the focus of ongoing tension between the discourses and ambitions of providers, on the one hand, and the ‘interests’ of consumers and discourses of sustainability, on the other. The outcome of this struggle determines what the smart meter’s main role will be: is it a consumer tool to reduce energy demand, or a tool which providers can use to better ‘manage’ consumers? Initial field tests indicated that smart meters, alone, would be unlikely to fulfil the promise of reducing energy demand. The most limiting feature was that smart meters were to take the place of the traditional meters they replaced, and therefore located out of sight: in cupboards, under staircases, in the cellar, or outside the home. As a consequence, the data they produced was likely to remain unread and unused. The proposed solution was to introduce an additional device: an in-home display, capable of relaying information from the smart meter to the household and of presenting it in a more visible, ‘user-friendly’ form. Without this device, it would be difficult to claim that the smart meter programme was in the public interest, or that it would help consumers reduce energy consumption and associated carbon emissions. This generated further discussion about who should provide this ‘extra’ bit of kit. Should in-home displays be included and paid for as part of the smart meter roll-out? Or, should they feature as optional extras – and as new consumer appliances? A ministerial order specified that the smart meter had to have an interface capable of displaying information to the consumer, thus supporting universal provision of the in-home displays. A few months later, it became clear that the interface could take the form of a website where consumers could log in and retrieve information about their electricity use. While seemingly favouring the universal provision of information as part of the new infrastructure, in practice, the outcome of the dispute allowed commercial actors to generate new market opportunities. If consumers want an in-home display (as opposed to looking at the website), they will have to buy one. Despite the official rhetoric, the smart meter – in use and in practice – is still unlikely to have significant impact on energy use and carbon emissions. Instead, intelligent metering has become a useful instrument for utility companies to reduce direct interaction with their customers, to help ensure that bills are paid on time, and to achieve significant cost savings. Meanwhile, the investment costs for the roll-out of smart meters are paid for by the consumers. In conclusion, the switch to smart meters also changed the role of the interface, as well as the relations between consumer and provider. What happens at the interface leads to the ‘black-boxing’ or provisional fixing of certain material, as well as organisational and institutional relations. The boundaries and responsibilities that are drawn at contested interfaces can have long lasting effects, because they literally become part of the material world – institutional and political arrangements become embedded in infrastructural systems. Belgrade’s district heating system is a good example – showing that contested interfaces are not only to be found in electricity networks. In Belgrade, Serbia, it’s the thermostat that’s at the center of debate. In common with other socialist states, Yugoslavia invested in large-scale district heating systems in its cities in order to optimise efficient resource distribution through centrally planned urban development and produce modern, healthy homes for the labour force. District heating consists of a network of hot water pipes and pumps that deliver heat generated at power plants into the central heating systems of a city’s buildings. There’s no room for individual preferences in Belgrade’s district heating system: residents cannot control the amount of heat from their radiators or when they come on or go off during the day or the year. The system sends heat out according to predetermined criteria such as the external temperature, and the service is paid for through monthly rates based on the number of square metres heated. Now that Serbia is working towards becoming an EU-member state, there’s a call for the utility to shift to a liberal model of prices charged per unit consumed. Furthermore, in the present system, overheating and limited control over the amount of heat used in the home are two sources of inefficiency. Despite these ambitions, universal provision is literally embedded in the infrastructure: the pipes run vertically through apartments linking bedroom to bedroom and sitting room to sitting room as they rise up through the building. Individual flats cannot be cut off for non-payment, as that would cut off the heat for the whole building. To find out how much heat an individual household is using, all residents in a building would need to fit heat allocators on each radiator, which are able to sense the amount of heat emitted. Furthermore, all radiators would need to be equipped with radiator valves to control the flow of heat. More radically, a switch to a liberal model would require a new pipe layout in which heating pipes are looped horizontally to provide a separate circuit for each flat. Belgrade’s district heating systems demonstrate that past infrastructural arrangements prefigure future possibilities. Obviously, this is not only the case in socialist regimes. In other European countries, infrastructures mirror the local political reality, which is often that of a market economy. Looking ahead, the smart electric meter may have long-term effects that are just as profound as those of universal heating systems in Belgrade. What happens at the interface has a potentially critical role in establishing, but also potentially disrupting preconceived categories of the individual consumer on the one hand and the collective infrastructural provider on the other hand. In each of the cases described above, it’s possible to imagine other scenarios, including scenarios that could bring significant reductions in energy use and carbon emissions. For example, in the case of smart electric meters, grid operators (who manage the infrastructure but don’t sell electricity) could become much more involved in the provision of data and associated energy services, including opportunities to remotely monitor and control home electricity consumption. This would extend the scope of collective provision into private homes, which offers possibilities for reducing and shifting energy use. For example, grid operators could remotely control air-conditioners, heating systems or household devices depending on the availability of renewable energy (provided that households also install smart socket outlets). If devices are considered to be part of collective provision, the energy provider could also have the power to lower the energy use of the network by introducing more energy efficient devices. Likewise, the district heating system in Belgrade could be made more energy efficient without switching to a liberal market model and the individual metering that goes with it. Although limited control over the amount of heat used at home is one issue, it’s not the only one. The infrastructure also loses large amounts of energy through leaks in the distribution network, and it relies on expensive, imported gas or highly polluting heavy fuel oil and coal. Better maintenance of the pipe network and the use of waste heat from factories or power plants could improve the financial and energy efficiency of the district heating system and lower its carbon emissions – without the need for metering technology and individual bills. This doesn’t mean that more collective provision is the only strategy for reducing energy demand. At the other end of the spectrum, we could envisage a large-scale deployment of off-the-grid systems for the provision of electricity, heat, and water. Such an approach extends the scope for individual consumption and largely eliminates the need for collective provision – the meter disappears altogether. People could install solar panels, wind turbines, batteries, rainwater harvesting systems, and biogas- or wood-powered heat production units. In such a scenario, ‘consumers’ would become responsible for producing their own energy or water. This means that whenever they increase the amount or the use of appliances, they would also have to make additional investments in their ‘infrastructure’, which would be a strong incentive to keep energy use in check. Between these extremes, other configurations are possible. To conclude, in order to reduce energy demand, we must also focus on the institutional settings in which technologies are designed and deployed. Contemporary assumptions about the non-negotiability of energy demand, the need for networks that are ‘always on’ and the taken-for-granted goal of economic growth are woven into politics and investment strategies at every scale. Interfaces represent perhaps momentary but nonetheless significant sites of uncertainty and opportunity. The future is being made in innumerable moments and places, but perhaps most intensely at such humble points of interface and junction. Infrastructures in practice: the evolution of demand in networked societies, Elizabeth Shove and Frank Trentmann, 2018: Routledge. Contentious interfaces: exploring the junction between collective provision and individual private consumption. Cathérine Grandclément, Magali Pierre, Elizabeth Shove, Alain Nadaï. District heating in Belgrade: the politics of provision. Charlotte Johnson. The French electricity smart meter: re-using smart meters as economic household interfaces. Aude Danieli.